DID YOU EXPERIENCE A WORK INJURY IN CHICAGO? Workers’ compensation provides financial support to employees who are injured or become ill on the job. Under workers’ compensation laws, injured workers are entitled to benefits that cover medical bills and lost wages, among other costs. It is possible to obtain compensation regardless of whether you are at fault for a workplace accident. However, workers’ compensation does not cover pain and suffering or other damages that are recoverable in a personal injury lawsuit. An average of 200,000 work-related accidents occur each year in Illinois, according to the state Workers’ Compensation Commission. More than 111,000 nonfatal workplace injuries and illnesses were reported among private industry employers in 2016. The U.S. Bureau of Labor Statistics found that the majority of reported cases (5.4 percent) were in the natural resources and mining industries, followed by government work (4.9 percent), manufacturing (3.4 percent), services (2.6 percent) and construction (2.1 percent). The most common types of injuries were overexertion, contact with equipment, slip and fall accidents, transportation incidents, and exposure to hazardous substances or surroundings. At the Chicago law firm of Briskman Briskman & Greenberg, our lawyers understand that a workplace accident can have a big impact on you and your family. We know that workers’ compensation benefits often need to go beyond simply covering medical bills and lost wages. They need to cover vocational rehabilitation. They also need to include the difference in wages if an injury prevents a person from returning to their regular job and forces them into a lower-paying position. Illinois employers are required by law to provide workers’ compensation benefits to injured employees and to report all workplace accidents. When we take legal action, it’s not against your employer. It’s against your employer’s workers’ compensation insurance company. All we want is to get the insurance company to do what they are supposed to — provide you the financial support you need after a workplace accident. When seeking workers’ compensation, many people are concerned with the impact the claim will have on their relationship with their employer. It should have no impact. Employers cannot legally fire you for filing a workers’ compensation claim. The law is clear that they cannot retaliate against you in any way, such as by demoting you or refusing to pay for medical bills resulting from the workplace accident. Otherwise, you will have the right to take legal action against them. In many cases, workers’ compensation is not the only avenue of obtaining financial support. If an accident also involved a third party, you may be able to seek compensation from the negligent party in a personal injury lawsuit. There are many potential causes of workplace injuries such as defective products, malfunctioning machinery, motor vehicle accidents or other hazards. If you were injured because of the carelessness of a third- party (not your employer or a worker), you may be able to file a personal injury lawsuit against the responsible party in addition to the workers’ compensation claim. Individuals who work as independent contractors may not be eligible for the same workers’ compensation benefits as an employee. In such cases, it may be possible to file a personal injury lawsuit for a work-related accident. It is important to note that the question of whether you are an independent contractor or an employee is determined by analyzing a wide variety of factors, and not the title given to you by the company for which you work. Most state and local government workers are entitled to receive workers’ compensation benefits just like non-governmental employees. However, there are exceptions. For example, Illinois police officers and firefighters cannot receive benefits through the state system. Federal government employees can seek workers’ compensation benefits when they are disabled while at work. They are required to submit claims through the Federal Employee’s Compensation Act. Railroad workers, seamen and other specialized employees also have specific federal acts that cover workplace injuries and illnesses. • Repetitive stress: injuries sustained by performing the same movement over and over again such as carpal tunnel syndrome or strained muscles. • Transportation accidents: injuries sustained while driving a vehicle when performing a job-related task, such as making a delivery or traveling between worksites. • Equipment mishaps: caught in or compressed by injuries sustained due to faulty machinery, often occurring in industrial settings or factories. • Construction accidents: these include falls from scaffolding or ladders, being struck by dropped objects, or slipping and falling due to uneven walking surfaces, among others. 1) Medical bills. Expenses for hospital visits, doctor appointments, treatment, surgery, physical therapy and medication are covered. Some employers have a designated medical provider for workers’ compensation claims. However, you have the right to see your own doctor. 2) Disability pay for lost wages. Commonly referred to as Temporary Total Disability (TTD), disability pay provides compensation for lost wages due to a work injury. In order to qualify for TTD, a doctor must find that you are unable to work because of a work-related illness or injury. TTD compensates workers for two-thirds of their usual paycheck until a doctor determines they are healthy enough to resume working. There are also benefits available for permanent disabilities. 3) Vocational training. When an injury prevents you from performing your normal job duties, you can qualify for vocational rehabilitation to re-train for a new occupation. You may also receive job search counseling to help you assess what other occupations are within your ability so that you can still contribute to the workforce. 1) Report the injury or illness to your supervisor or employer immediately. Workers’ compensation cases are time-sensitive, so it is always wise to report an injury or illness as soon as possible. Your employer should ask you to fill out an injury or illness claim form even if you have already reported the incident verbally or in writing. If your employer does not have a form available, then note down the facts of the injury or illness in writing. Keep a copy of the documents for your records. Make sure you are thorough and specific when reporting the incident. Include as much information as possible about the accident and any witnesses. A common reason injured workers are denied workers’ compensation is the lack of detail in their accident report which can serve as key evidence in a claim. 2) See a doctor for medical treatment. Many times an employer will have a designated medical provider for workplace claims. However, under Illinois law, you are entitled to see a doctor of your own choosing. Make an appointment and get treatment promptly. Inform the medical professional that the injury or illness occurred because of a workplace incident, including details about how it happened and the symptoms you experienced. If the doctor believes you cannot resume working because of your injury, be sure to ask for them to put it in writing. Inconsistencies between the accident report and medical records can lead to problems and possible denial of workers’ compensation benefits. 3) Contact a knowledgeable workers’ compensation attorney for a free legal consultation. Suffering an injury or illness at work is likely to be a difficult experience that can leave you feeling uncertain about what to do. Workers’ compensation attorneys are skilled in pursuing the full range of benefits a worker can receive following a workplace accident. They can help you answer any questions you may have, determine whether you have a compensable claim, and ensure your rights are protected throughout the process. Workers’ compensation attorneys are also aware of the latest regulations to help you navigate the legal complexities of these types of claims. Having qualified representation by your side is essential to obtaining the compensation you deserve. Contacting a workers’ compensation attorney as soon as possible will ensure that your claim is filed promptly. Workers’ compensation, sometimes called workman’s comp, is something your employer is required to provide. The workers’ compensation process begins when you are injured, as your employer is required to report all workplace injuries. When we take legal action, it’s not against your employer. It’s against your employer’s workers compensation insurance company. All we want is to get the insurance company to do what they are supposed to — provide you the financial support you need after a workplace accident. When seeking workers compensation, many people are concerned with the impact the claim will have on their relationship with their employer. It should have no impact. Employers cannot legally fire you for filing a workers’ compensation claim. The law is clear that they cannot retaliate against you in any way, or you will have the right to take legal action against them. In many cases, workers’ compensation is not the only avenue of obtaining financial support. If an accident also involved a third party, you may also be able to seek compensation from the negligent party in a personal injury lawsuit. We have decades of experience helping people like you get fair compensation. We handle all workers’ compensation and work injury cases, from those that involve bumps and bruises to those with permanent injuries, including carpal tunnel syndrome. 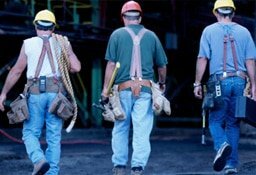 We help everyone from construction workers to office workers get the compensation they need. Contact us to arrange a free consultation with a knowledgeable Chicago workers compensation attorney. We represent clients throughout Chicagoland, including the cities of Joliet, Milwaukee, Waukegan and Zion, and the counties of Cook, Lake and Will. When you call Briskman Briskman & Greenberg for a free consultation, you will speak directly to an experienced attorney in Chicago, usually one of the firm’s principals, who will assess the facts of your situation and advise you of your rights. All workers’ compensation cases are handled on a contingency basis, which means we will only accept payment if we are successful in getting you compensation.